The world is going… err… has gone smart. At least, the data published by latest Gartner report makes us believe this. 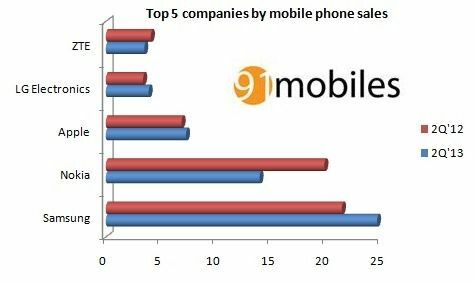 If the report is to be believed, the mobile handset industry grew 3.6% in second quarter of 2013 when compared to the same period last year (termed as Year-over-Year or Y-o-Y Growth). While sales of total mobile handsets reached 435.2 million, smartphones are now contributing a major chunk of total units. In the second quarter, smartphones accounted for 51.8% of total sales, beating the feature phones for the first time. Out of 435 million units, 225 units sold were smartphones registering a Y-o-Y growth of 46.5%. Rest 210 million units were feature phone registering a decline of 21% in comparison to same period last year. Android definitely leads the race contributing a whooping 79% of total sales followed by iOS and Microsoft. With support from Nokia and with more polished Windows Phone 8 OS, Microsoft successfully knocked out Blackberry from the third position. These figures are certainly inline with the Global Smartphone Market report published by IDC last week. Who is leading the race? Samsung successfully replaced Nokia last year as world’s no.1 mobile seller and is still leading the race. Nokia, with a majority of feature phones in its portfolio holds the second position followed by Apple, LG and ZTE. 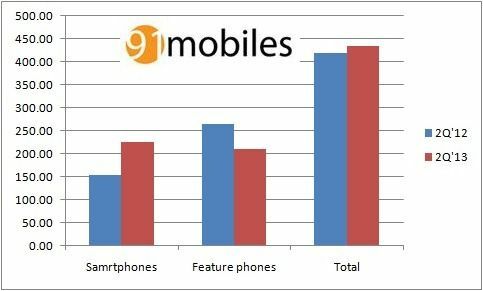 However, declining sales of feature phones should bell an alarm for Nokia and we guess the company needs to get more aggressive with its Asha and Lumia lineup of mobile phones. The mobile industry is doing well and the smartphone industry is doing even better. Analysts estimate a total sales of around 1.8 billion mobile phones this year which seems to be feasible. With dropping price and improving technology, smartphones are also expected to improve their market share significantly by the end of this year. Its surprising to see such a huge market is being lead by a handful of players. Kudos to Android which turned the market dynamics upside down in last few years. And kudos to Samsung for being an intelligent opportunist player.